This sauce also works really well for chicken or white fish. I usually reserve some of the sauce to add to the side dish if serving rice or potatoes. The creaminess makes a great base for mashed potatoes. 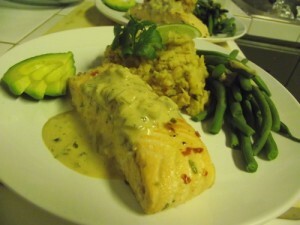 Lay the salmon in a flat bottom casserole dish and cover with sauce. Bake Covered until salmon is fully cooked but tender (about 325 F for 10-12 min depending on thickness of pieces).